How many times do you watch a song's music video? How many times do you listen to the song MP3? I bet for the first question you can count the times, but for the second one you definetely cannot count the numbers. That is to say, people prefer to convert music videos to audio in MP3 for offline listening. Thus a video to audio converter for Mac is the blessedness for music fans, enabling you to convert videos of MP4, MKV, FLV, AVI etc. to MP3 as iPhone ringtones or for playing on iPhone X/8/7/6/6 plus/6s, iPad, Android, etc. Here comes the issue. Among so many MP3 converters these days, which is the best one for you to extract MP3 from video? We’ve list top three featured video to MP3 converter for Mac for you as the back-up options of the best one. MacX Video Converter Pro is not as famous as Handbrake and VLC at present time. But it deserves your attention for its outstanding performance on video converting including video to audio conversion. The program is proficient in extracting MP3 from video as well as AAC,FLAC,AIFF,WMA etc through the professional "to Music" preset. In addition, different from other audio converters for Mac, MacX Video Converter Pro is capable of converting MOV, AVI, FLV, MKV, MP4 to MP3 of multiple tracks, enabling you choose different language tracks. Furthermore, if you only need a segment of audio in videos, the edit function of MacX Video Converter Pro makes it possible to trim a snippet. As an open source tool, there is no one better than Handbrake on ripping DVD and converting video from format to format, even extracting MP3 from video. It's totally free to switch video to audio in MP3 at express speed with alterable audio quality, which saves your converting time and ensures the high quality of the target MP3 audio. 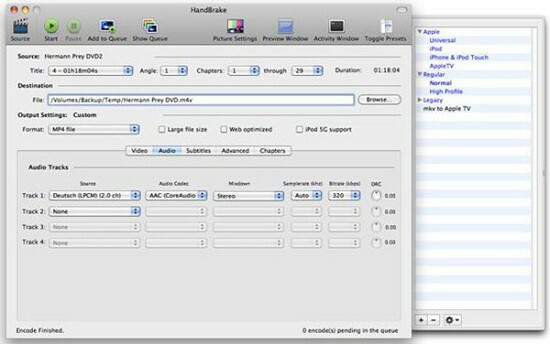 However, Handbrake is not a so professional video to MP3 converter for Mac because it has no direct output option of MP3 so that you can only select MP3 format under the option of MP4 which makes Handbrake a little bit complex. VLC is an simple fast and powerful media player, supporting video converting and streaming at the same time. There is not doubt that it could do a great job on extracting MP3 from MP4, MOV, FLV and Youtube. For those who are not so particular about music converting, VLC is absolutely good enough as an audio converter on account of the terrific audio quality. However, compared with other video to MP3 converter running on Mac, the converting speed is a little bit slow. As many people encounter in the case like that when converting MP4, FLV to MP3, the total time of the song doubles and the converting process goes slowly. 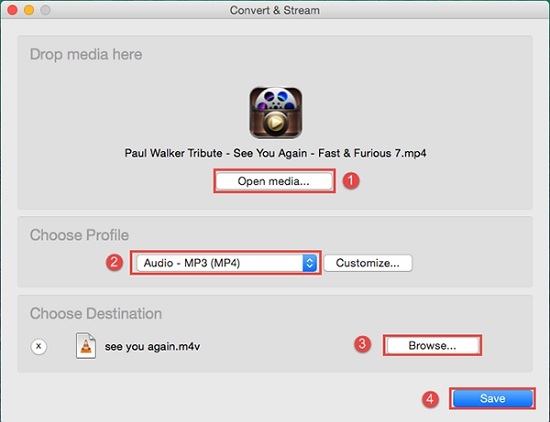 Already knew the top three video to MP3 converter for Mac, you may be more curious about the steps. 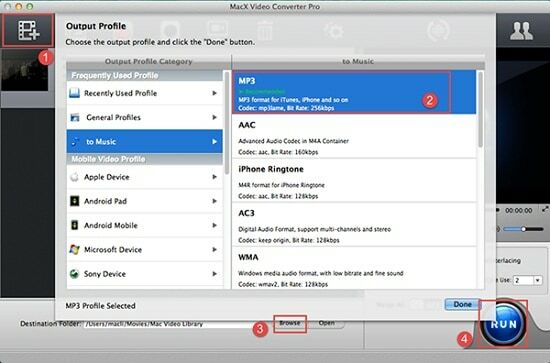 The following tutorial will show you how to get MP3 audio from videos with MacX Video Converter Pro. 1Add files. Free download the video to MP3 converter and run it. Click "Add Files" button to import the video you intend to convert. 2Choose the output formats. Click "to Music" icon to find your target audio formats such as MP3, AAC, FLAC, WMA etc. Here we'd like to choose MP3 for a better compatibility. 3Specify output file path. Click "Browser" button to choose the destination of MP3 to be converted. 4Start converting video to MP3 format. Click "RUN" button to start the conversion process. Alternatively, if the music is in a movie just as See You Again in Furious 7, you can do one more step to cut out the song part in the movie. Simply click "Edit" to enter the edit interface, then click "Trim" icon to set the start and end time. Having that done, then follow the steps above. Of course, if it's possible, you prefer to download MP3 online as a matter of course with MacX Video Converter Pro. But sometimes only video MP4, FLV can be downloaded from website like YouTube. Never mind! You can also take above steps to convert video FLV, MP4 to MP3. It is particularly worth mentioning that other than a video to MP3 converter for Mac, MacX Video Converter Pro is to some degree a photo slideshow maker and streaming video capturing software which enable you to make a stunning slideshow with background music and capture streaming videos as you like.